Hello friends!! 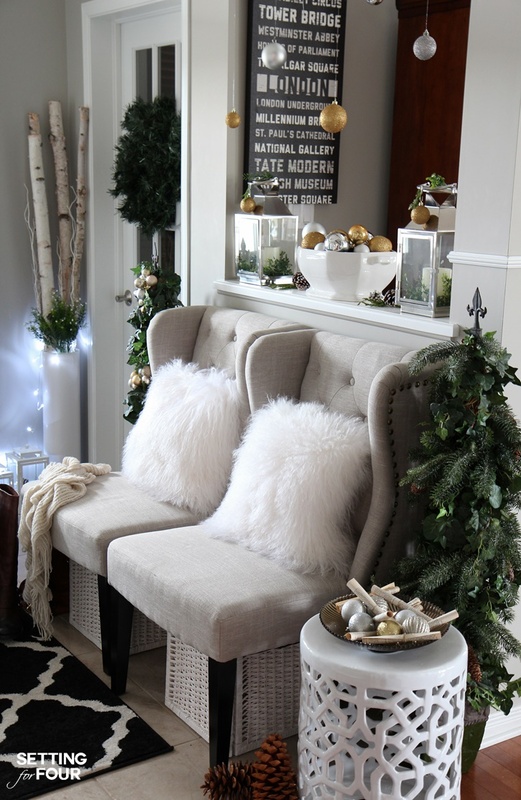 I’m so excited to share with you my Woodland Chic Christmas Home Tour with Country Living Magazine today! 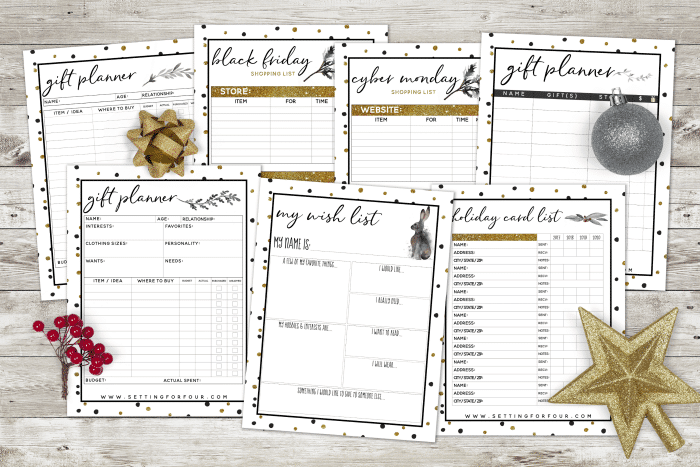 I hope you like glam shimmer, metallics and shine mixed with lots of natural elements, woodland icons and neutrals! 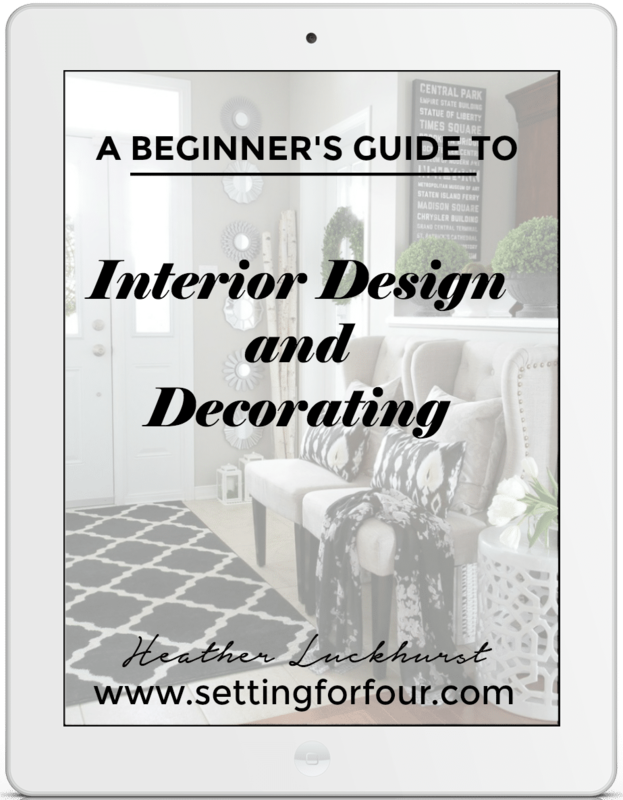 If you’re visiting from Design Dining and Diapers – welcome!! 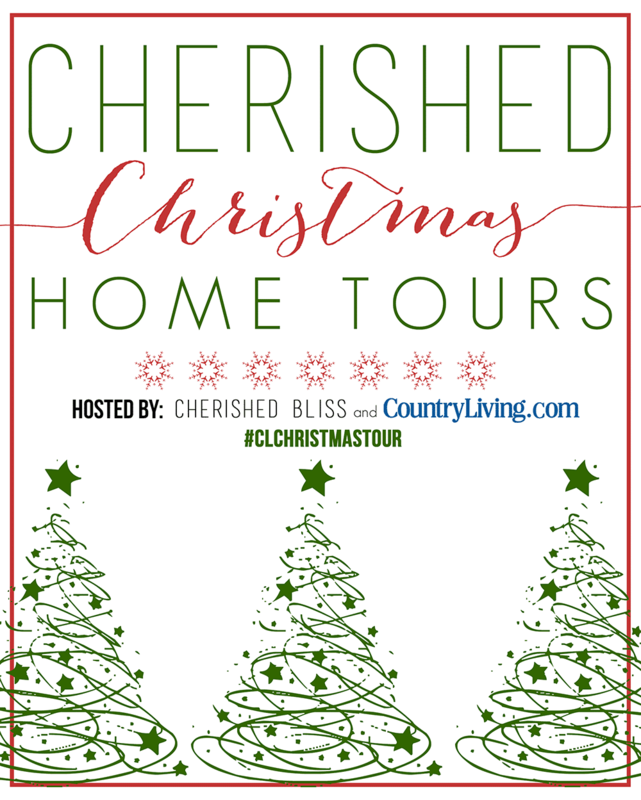 I’m so thrilled to be joining the co-hosts of this Holiday Home tour, Country Living Magazine and my talented friend Ashley at Cherished Bliss! 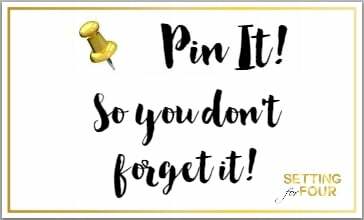 Be sure to see the resource list at the end of this post to get this look! 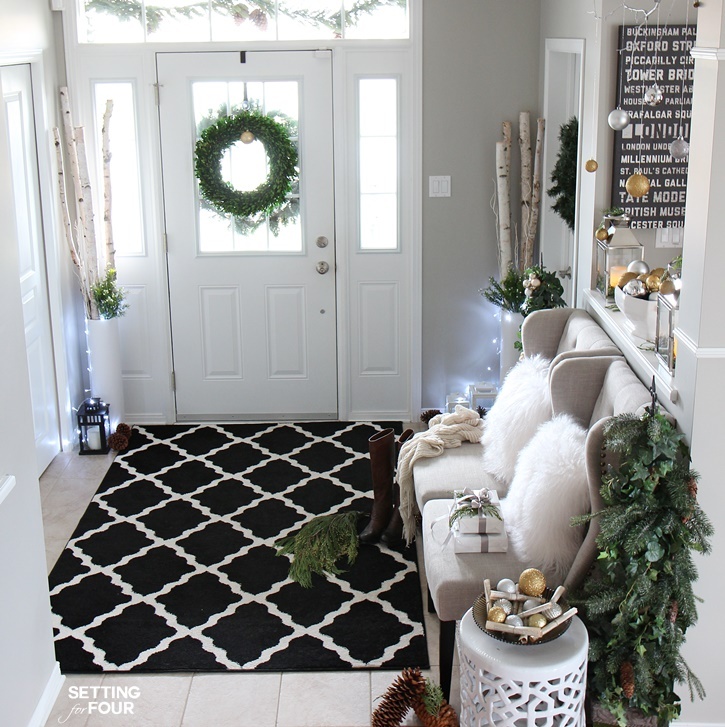 I’m so so excited to show you my home for the holidays! 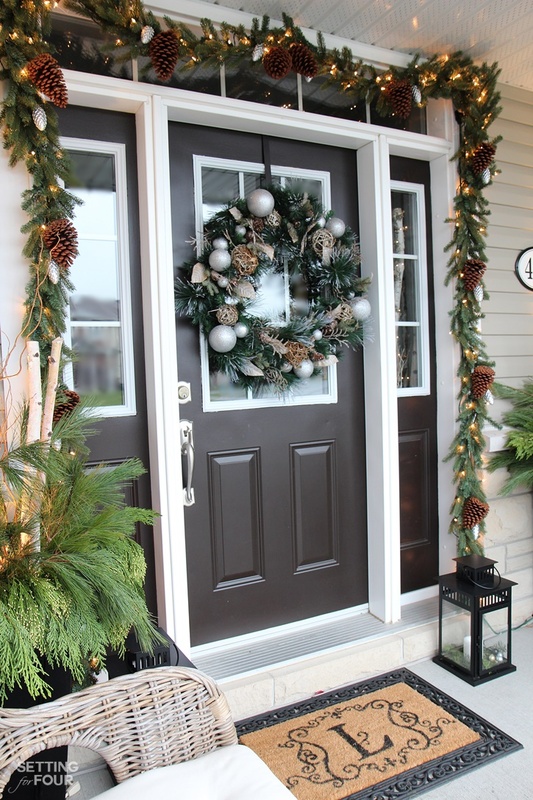 Welcome to my Woodland Chic Christmas Home Tour! 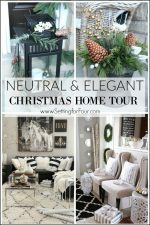 Be sure to check out all of the amazing Christmas decorating inspiration at the end of the post: 27 bloggers are opening their doors for you all week to see their gorgeous holiday homes and decor ideas. So let’s start the tour with our entryway! 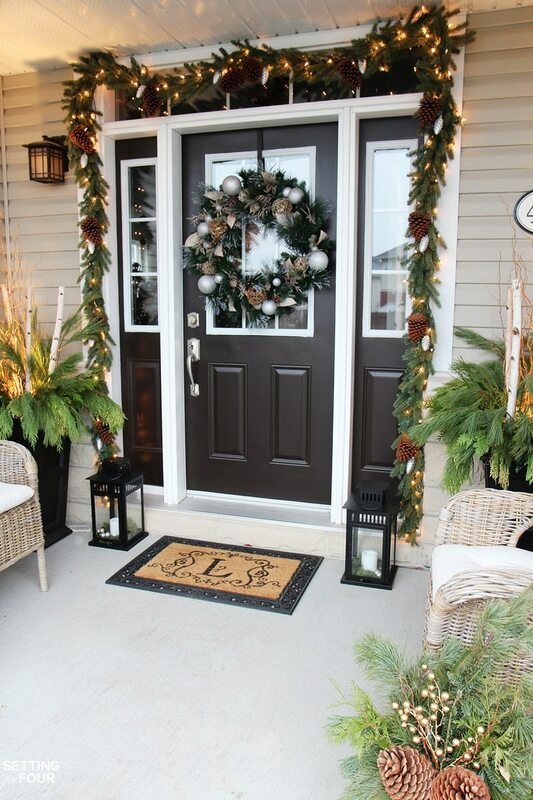 I love creating a beautiful entryway to greet my family and guests over the holidays! 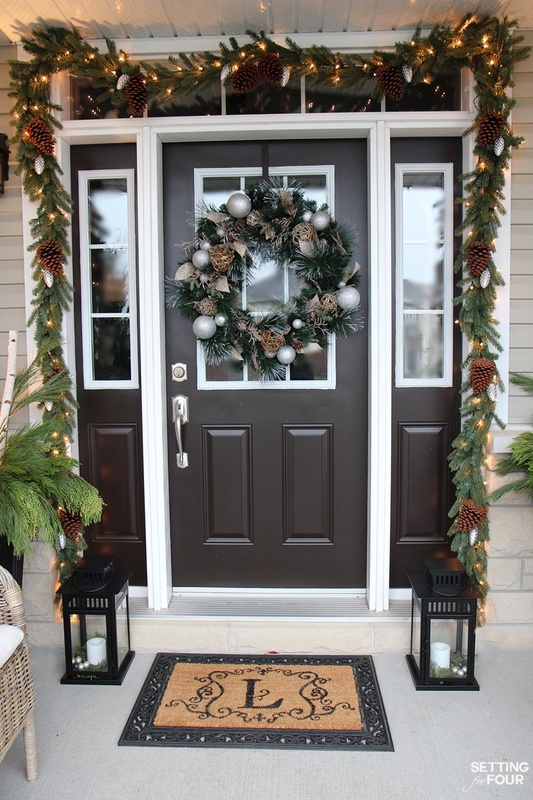 Adding festive curb appeal with deep green pine garland, a big wreath, urns filled with birch and cedar and candle filled lanterns is one of the first things I make sure I do for the holidays. Click on the below links to get this look! 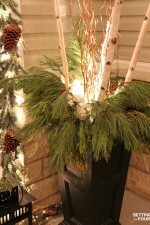 In the foyer I added holiday sparkle and cheer with a black, silver and gold palette. I hung a branch I found in the woods behind our house which I spray painted silver) from the ceiling and hung metallic silver and gold ornaments from it….love! Don’t you love the pattern of this garden stool? 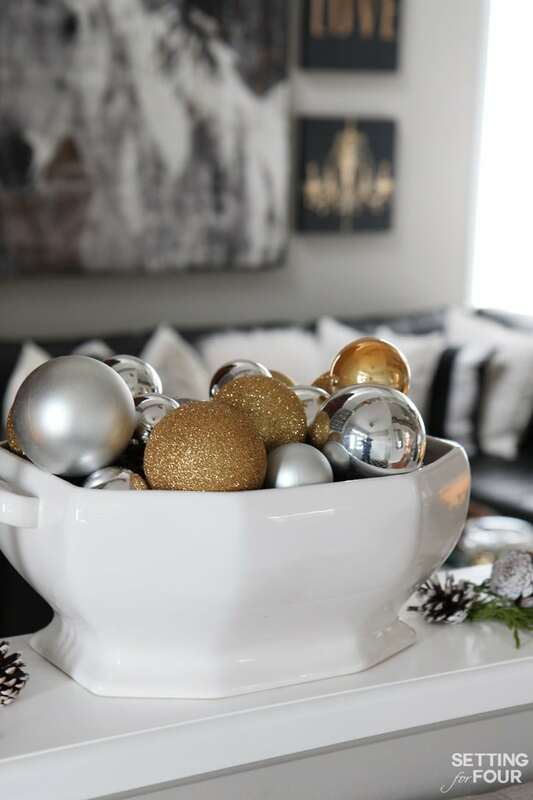 I made this holiday centerpiece in minutes by filling an ironstone bowl with more silver and gold metallic Christmas ornaments! 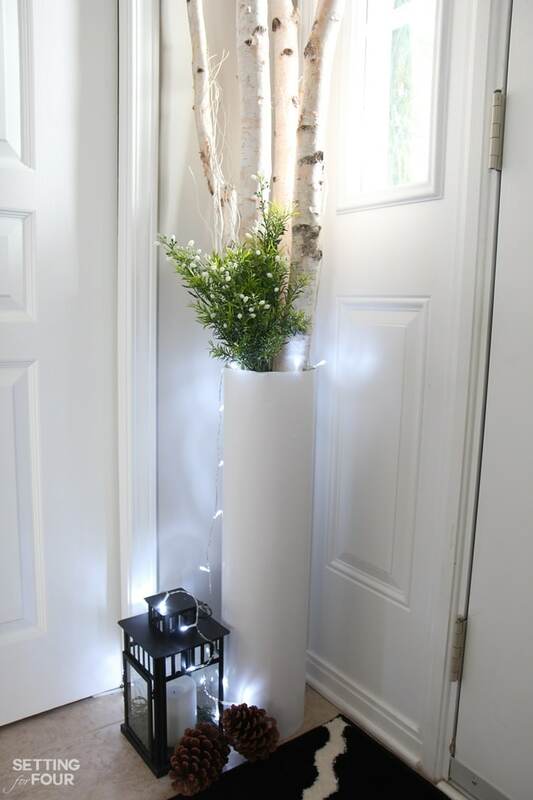 We are lucky to have birch trees all around our home – I love to put tall birch branches in a big vase to add height to the corners of our foyer. 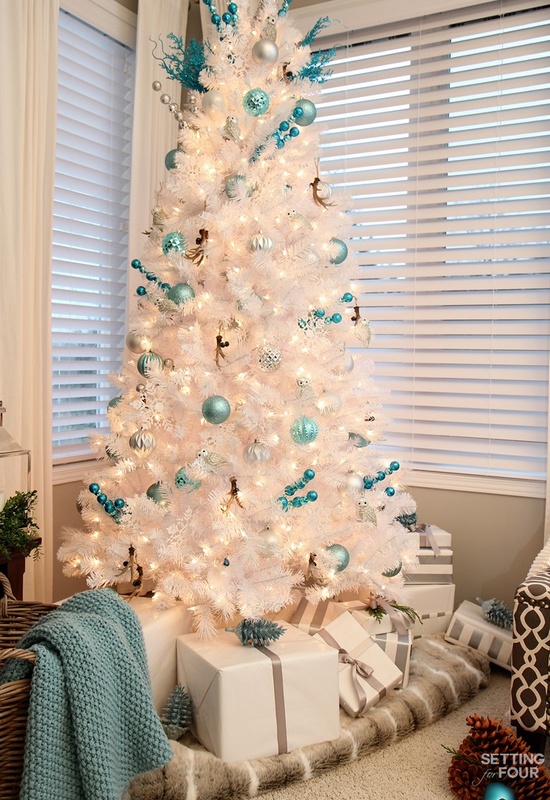 Next up in the home tour is our living room and our Woodland Chic Christmas tree! It’s white with clear lights and at night it literally fills the room with the most gorgeous glow! 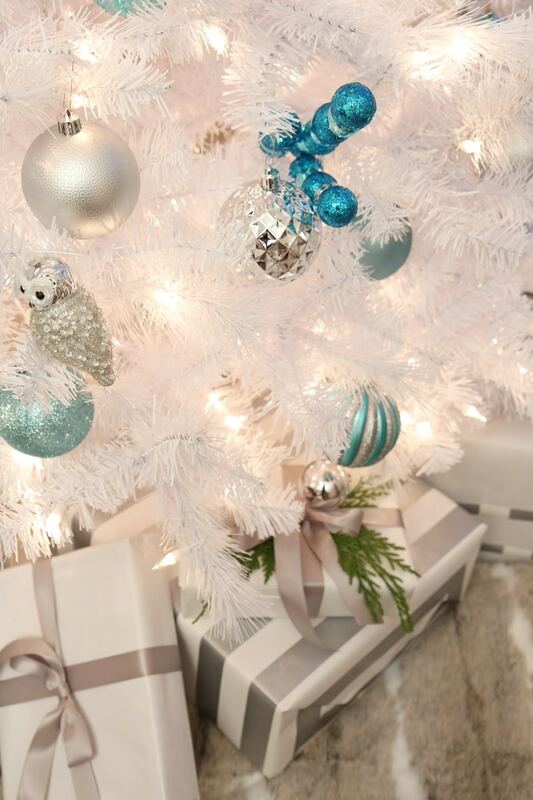 I decorated our tree with a Woodland Chic theme….glittered owls, antlers, shimmery pine cones and a faux fur tree skirt give our tree woodland style and lots of metallic blue, white and gray ornaments add glam and elegance! 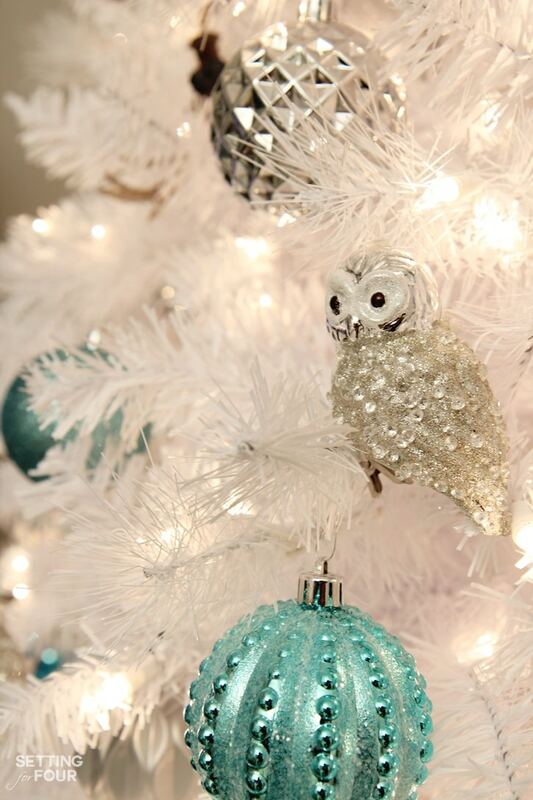 I added some sparkly blue picks to the top and some silver and blue ball picks all through the tree – they remind me of shooting stars! 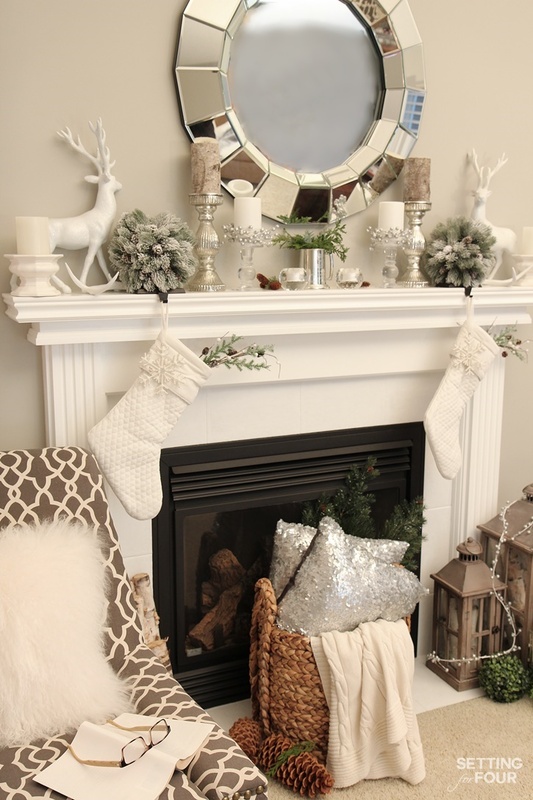 I gave our mantel some woodland magic too! 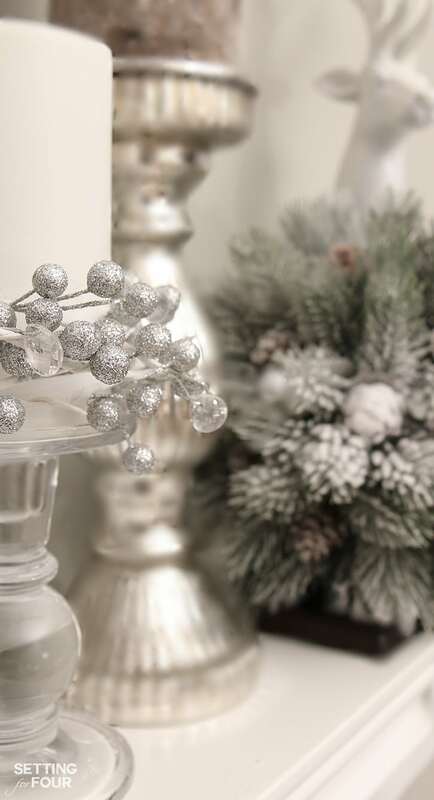 Sparkly white deer, snowy pine spheres, birch candles mix with more metallics. Silver sequin pillows make my heart pitter patter! I found this amazing silver and ‘crystal’ garland at the dollar store. I simply wrapped it around two candles for instant holiday candle rings! Our stockings are hung and ready for Santa to swing by! 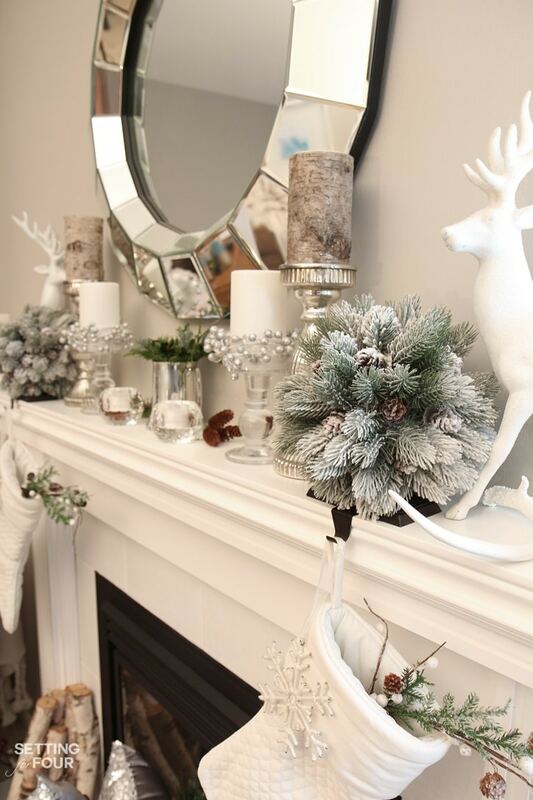 I hope you enjoyed my Woodland Chic Christmas Home tour! I’m wishing you and your family a beautiful Christmas filled with lots and lots of laughter and joy! 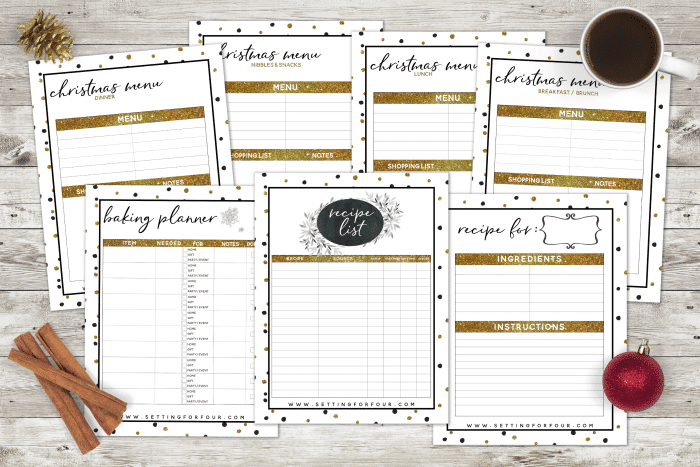 Don’t forget to pin this to your Christmas board! 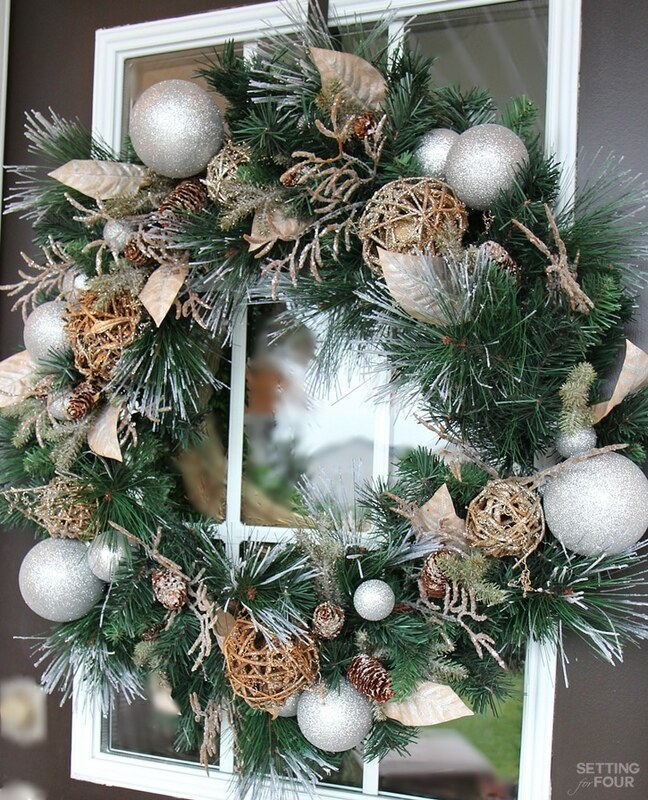 You can see all the holiday decor I’m pinning here! Heather your home is stunning. Everything looks magazine perfect! I especially love the touch of the hanging ornaments in the foyer… I think too many people overlook the effect of something hanging can have… it is both elegant and whimsical! Bravo, friend! 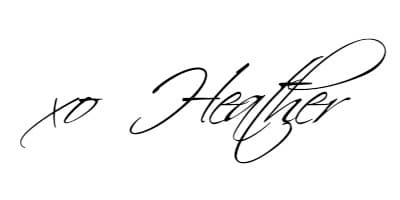 Your home is always so elegant and classy Heather, but you’ve made it cozy and inviting as well. Love it all!! Aw – thanks so much Kristin! Glad you like my Christmas decor! Happy Holidays!! I love the silver mixed with the rustic. So pretty. Oh my, how I love those fur pillows too. Lovely. Wishing you a wonderful holiday. Happy Holidays my glamorous friend!! Your home is lovely! I especially like the entry with the birch, pillows and pretty balls. Thanks for sharing your home. You’re welcome Elizabeth – thanks for visiting and your wonderful compliments! I’m so glad you like my holiday home! 🙂 Happy holidays! Heather, your home is stunning. I love all the little touches of sparkle and glam. I am obsessed with those pillows too! I think our fur kiddos would have a field day with them though. Yikes. I hope you have a wonderful holiday season! So nice to be touring with you again and with Country Living Magazine. Heather, your Christmas home is gorgeous!!! Love the glitter and glam. And, I have voted over and over for your La-Z-Boy room!!! It is definitely the winner!!! Yep, I can’t live without glitter and glam Sue!! 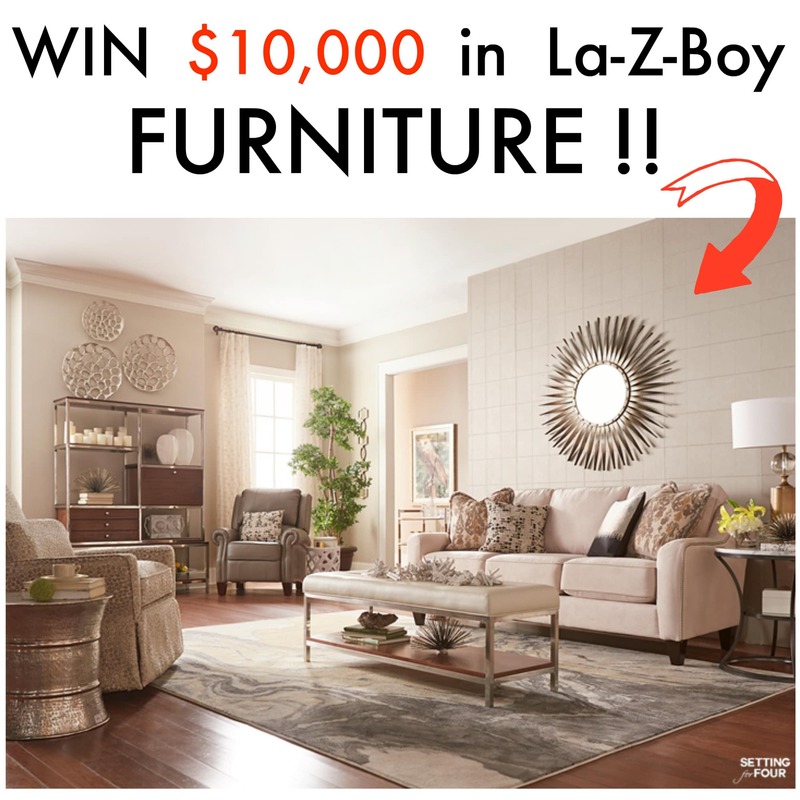 Thanks for voting for my La-Z-Boy room – I so appreciate it!! I think ‘glam’ should be your middle name — you’ve #nailedit! Everything is lovely and festive. Happy Holidays to your and your family. HUGS!!! LOL Thank you Kelly!! I do love my glam! Merry Christmas friend! 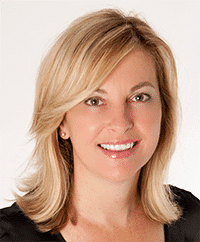 Heather, your home looks gorgeous! 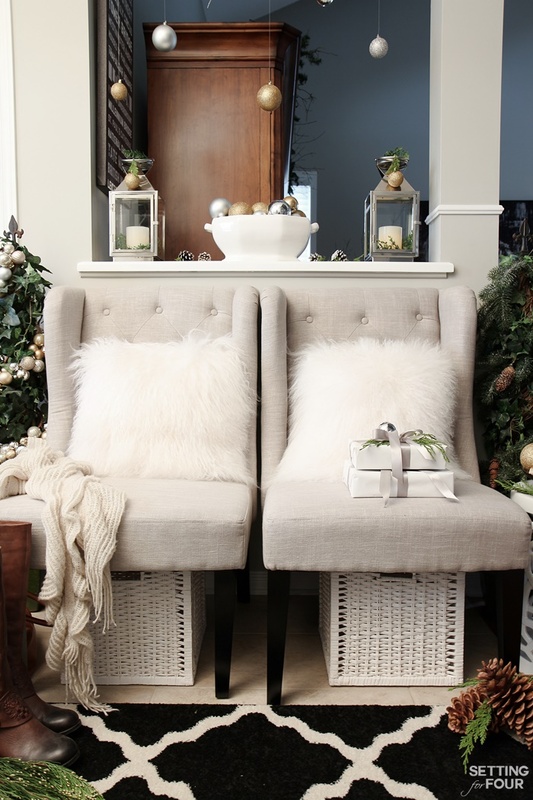 I love the entryway – I can see why you’re obsessed with the fur pillows. I would be, too! So stunning! 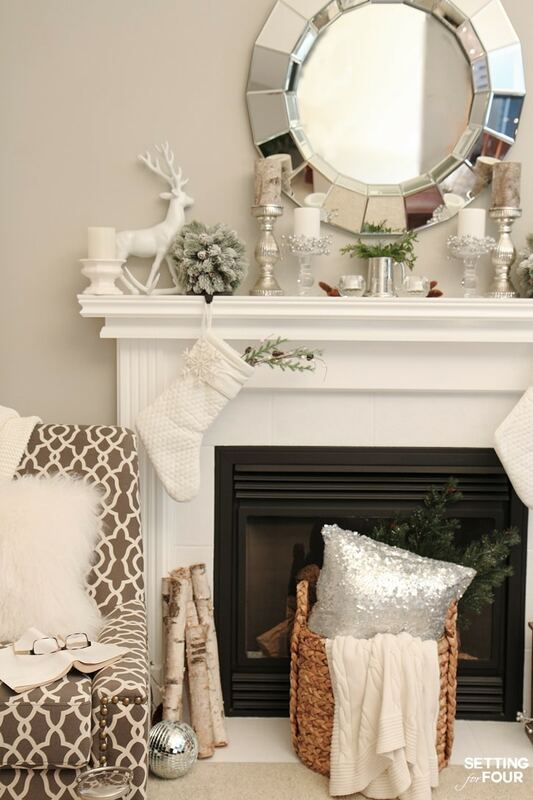 It’s glamorous and beautiful yet still homey and cozy. Great job (as always) Heather! Merry Christmas! Hugs and thanks Kim for your lovely comments! Happy Holidays! So pretty, Heather! I love the chairs in the foyer & the hanging bulbs!! It’s so beautiful, Heather. You have such a knack or making everything look glamorous yet livable. I love it so much! Thank you Chelsea – you are so sweet! Happy Holidays my friend! 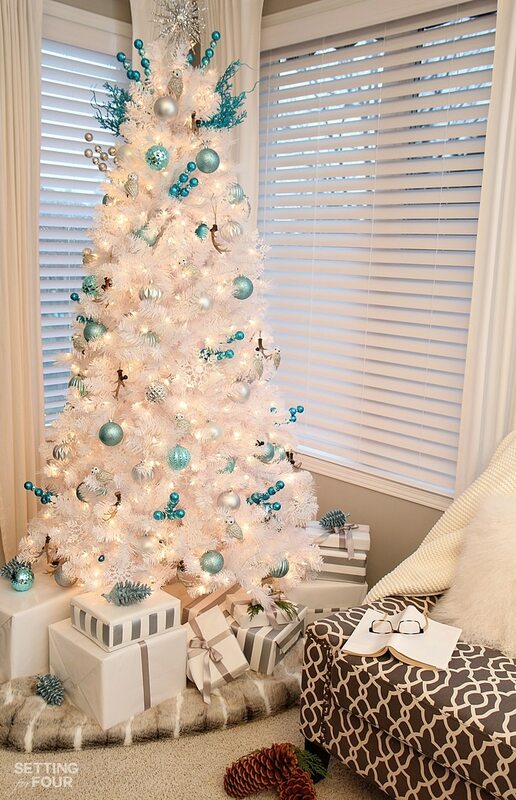 Heather, I love all of your cool white holiday decor, and I REALLY love your white Christmas tree! Great tour!!! 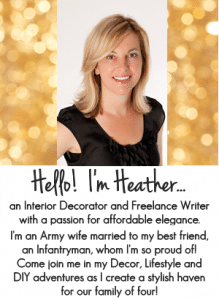 I love your woodland chic tour, Heather!! 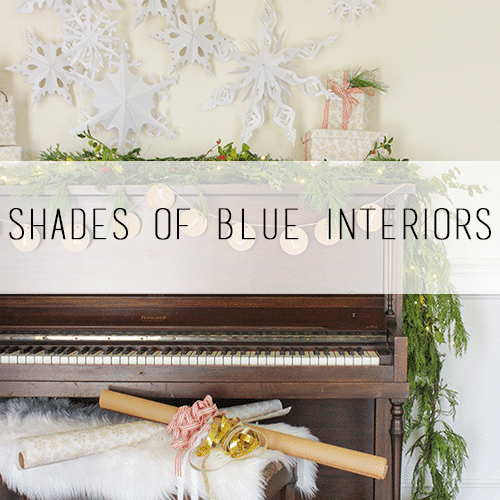 The hits of blue mixed in against all the white and glam metallics. Stunning!! It feels like the perfect spot to spend a cozy wintery Christmas evening! Hello. 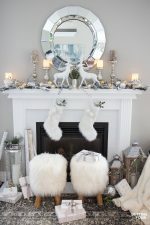 Ive been trying to find the round mirror on the white mantel. Is there a direct site to purchase it? Ive been looking everywhere. I know Homegoods was mentioned, but I cant seem to find it. Can you tell me the manufacturer or a link where to purchase it? Sorry if its been listed and I missed it. Hi Lisa! 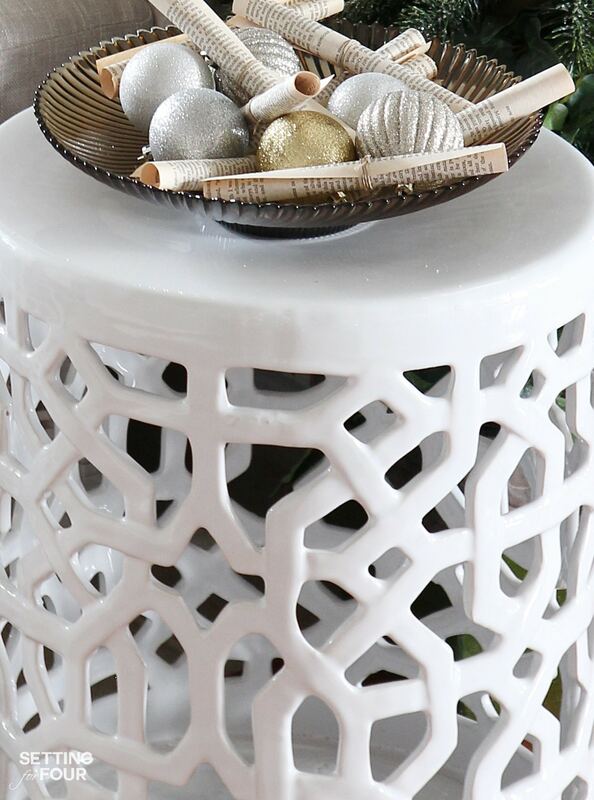 Yes – I bought it at Homegoods but I found one that’s very similar for you ! This one http://rstyle.me/~7BHaz (affiliate link) is the same shape and has the gorgeous faceted edge like mine! Thanks for visiting my site!